Glaciers on Mount Everest, the world’s tallest peak, are melting. Scientists say climate change could be a possible reason. Data from a recent study shows that glaciers on the Mount Everest region have shrunk by 13 per cent in the past 50 years, and the snowline has shifted upward by 180 metre. The finding was announced at the scientific conference, 2013 Meeting of the Americas, in Cancun, Mexico on May 14. The four-day meeting is organised by the American Geophysical Union (AGU), a Washington based non-profit of scientists working in the area of geophysics. The study is led by Sudeep Thakuri, as part of his doctoral research at the University of Milan, Italy. The Intergovernmental Panel on Climate Change (IPCC) and the Water Research Institute-Italian National Research Council are funding this research. Everest, which rises 29,029 feet above sea level and is the highest peak in the world, is a part of the Himalaya mountains. Thakuri and his team reconstructed the glacial history of Mount Everest using satellite images and topographic maps. According to Thakuri, glaciers smaller than one square kilometre are disappearing faster and have experienced a 43 per cent decrease in surface area since the 1960s. Since the glaciers are melting faster than they are replenished by ice and snow, they are revealing rocks and debris that were previously hidden deep under the ice. These debris-covered sections of the glaciers have increased by about 17 per cent since the 1960s. The ends of the glaciers have also retreated by an average of 400 metre since 1962. 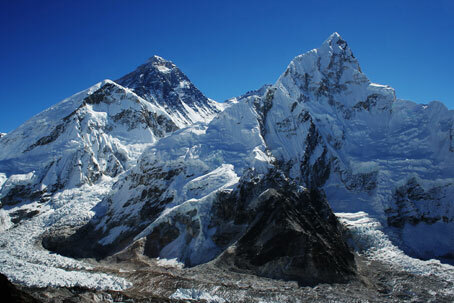 The researchers also studied the effect of glacial change on Sagarmatha National Park which is a protected area in the Himalaya in eastern Nepal. The majority of the glaciers in the national park are retreating at an increasing rate, reads a statement released by AGU. Though researchers have not yet established a link between the glacial retreat and climate change, they suspect the latter is the reason. Scientists also made an evaluation of temperature and precipitation patterns in the area. It showed that the Everest region has undergone a 0.6°C increase in temperature and 100 millimetre decrease in precipitation during the pre-monsoon and winter months since 1992. Researchers say that the glacial retreat can have an impact on the populations living downstream. “Downstream populations are dependent on the melt water for agriculture, drinking and power production,” said Thakuri. Continuing his research, Thakuri plans to understand the behaviour of the hydrological cycle and future water availability by exploring the climate-glacier relationship.